St. Patrick’s Day is approaching and I am here to tell you that you do not need to make corned beef and cabbage to be in the spirit. Make anything green — spinach risotto, kale salad, a mint chip smoothie — and you’re good in my book. I actually discovered recently that split pea soup can have Irish roots. Who knew? So this might be a nice way to have a healthy and delicious St. Patrick’s Day dinner without a lot of fuss. 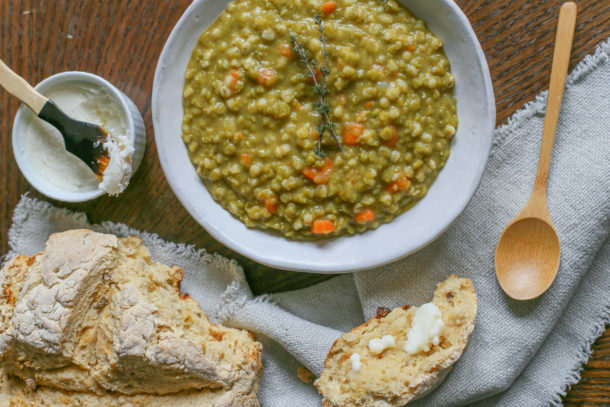 My husband loves soup of any kind and split pea is one of his favorites. It’s really hearty and earthy, a very peasant-y dish. His grandmother used to make it often with potatoes, but he’s come around to this recipe which is adapted from California Pizza Kitchen, the national chain of restaurants which is more famous for their pizzas than their soup. 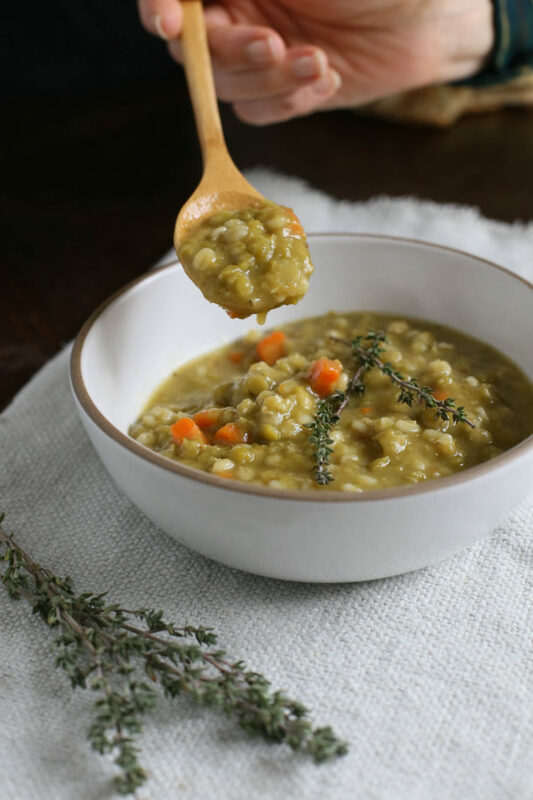 Classic split pea soup is usually cooked with a hambone or a piece of pork. I don’t eat pork and still think this tastes rich and flavorful. What this soup has that I think is different and delicious is the addition of barley — a fiber-rich grain with a silky texture. Split peas contain about 16 grams of protein per cup and a whopping 16 grams of fiber. In addition, they are rich in B vitamins (especially folate and thiamin) and manganese. When I make this soup, it is a full meal which I might complement with a side salad. 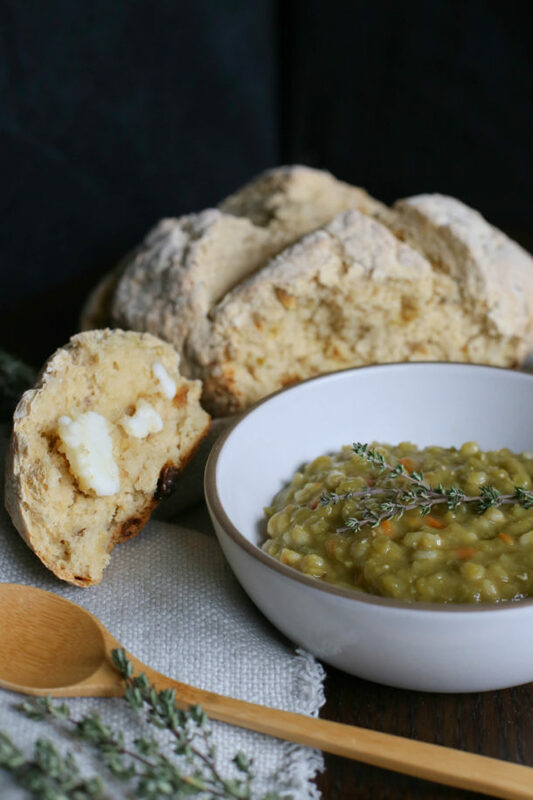 If you really want to go all out, you can whip up a homemade Irish Soda bread and serve it warm out of the oven with this soup and I think you will be very popular. At least I was when I served both together a few weeks ago! This year St. Patrick’s Day falls on a Friday, which would make this soup Lent-appropriate since it is meat-free. I’ll post the recipe for the Irish soda bread before St. Patrick’s Day, not to worry! In a large pot, combine peas, barley, water, bay leaves, salt, shoyu, thyme, garlic, sage and cumin. Bring to a boil over high heat. Reduce heat to a low simmer, cover and cook for about 20 minutes, stirring occasionally. Stir in carrots, onion, and celery. Cover and simmer until vegetables are tender, another 25 to 30 minutes, checking periodically and adding small amounts of additional water if needed. Discard bay leaves. Ladle soup into warmed soup bowls and garnish with green onion tops, if desired. *They are labeled "pearled" but they are really semi-pearled. 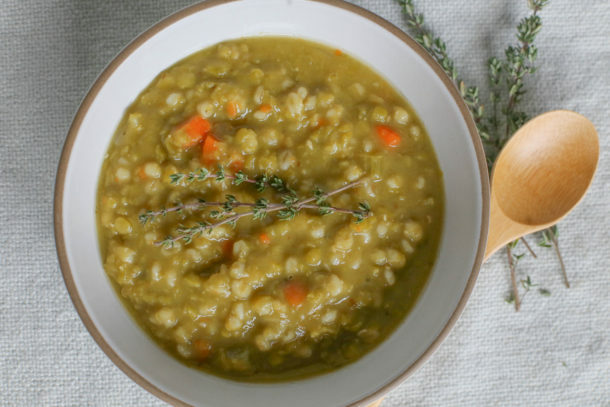 Could I substitute split peas with red lentils? And how much sould I use? I also have mungo beans, but I can’t find split peas and I’m really keen to try this recipe tomorrow! You can sub red lentils for the split peas, but it’s a different flavor and obviously a different color. Sub one for one. I love the look of the rolls you served with this soup, did you make them yourself? If so I would love the recipe. The soup is just delicious, I will make it again and again. Thank you. I just made this…YUM!!! Thank you so much for the recipe. I made it with quinoa since we are GF. This was a great soup on Friday and for St. Patrick’s Day. I have never used split peas before and they were so easy to cook. The flavors were just perfect. I brought some to my mom’s house and I made my mom try it. She liked it even though she said she didn’t like split pea soup. I made the Irish Soda bread too. I am not the best baker but it came out ok. I want to try it again. My family thought it was really good. Thank you for another no meat/lent meal. Although I have made various types of soup with barley, I had never used split peas until I tried your wonderful recipe. The soup is so warm and comforting, not to mention delicious, especially on a cold, rainy day. My husband prefers a “soupy” soup, so I did add more liquid as you recommended. Of course he really enjoyed it. I make many different soups during the winter, and this one is definitely a winner! Thank you so much! Thanks, Mia. There’s still plenty of chilly weather left for us to enjoy this soup. Glad you gave it a go! 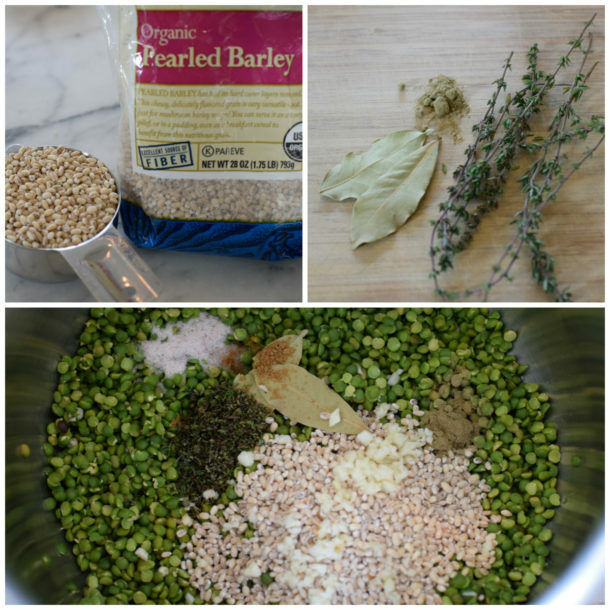 What is a good grain substitute for the barley – for those with gluten free diets – like us! Try brown rice or even GF whole oat groats. They may take longer to cook, though.